I know blog land is overrun by resolutions, goals, and all things “fresh start” so I thought I’d throw in my little spin on an awesome New Year project. I introduce to you The Wonderful Jar. I have a pretty bad habit of focusing on the negative things in life instead of the positive. Don’t we all? Well I don’t want my girls to grow up with that being what we dwell on. I read about this idea online somewhere in the past few days and thought it was such an amazing idea that I had to put it into action immediately. 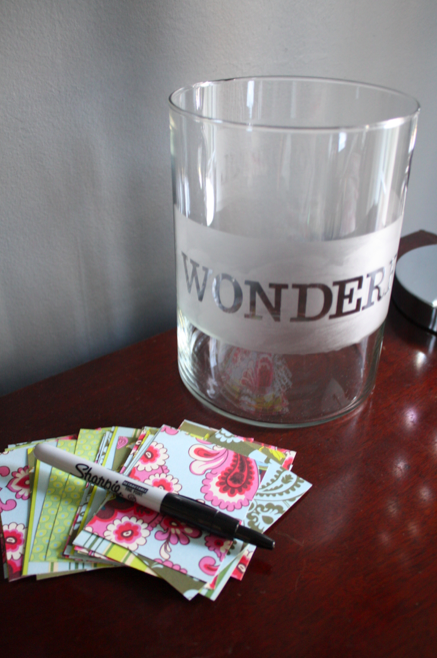 The Wonderful Jar is going to stay on the buffet in our dining room this whole year. Every time something wonderful happens to any of us, whether it’s monumental or a little thing that makes us smile, we’re going to write it on one of the pieces of paper and drop it into the jar. Over the course of the year we’ll be able to visually see all the amazing and wonderful things happening to our family and on December 31st this year, we’ll sit down together, dump out the jar, and focus on all the wonderful things that happened to us this year instead of grumbling about the negative. The girls are still really little and though I think Sofie will catch on quickly, I want this to be something we do year after year that they look forward to with anticipation and that it will help them to focus on the positive in their lives daily instead of being upset about the downfalls. I thought The Hubs might be a little hesitant, but he was pretty excited about the idea! 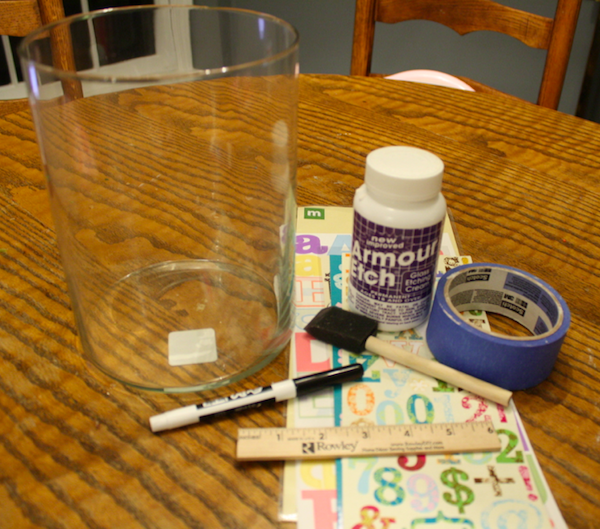 My Wonderful Jar took only 30 minutes to make and used items I already had at home! 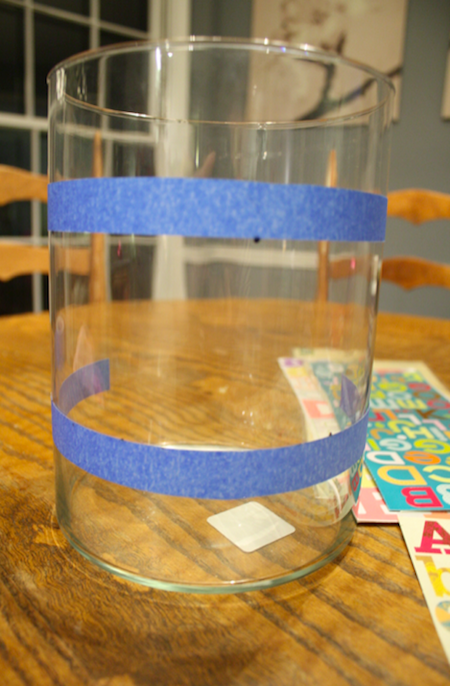 First I measured in 2.5″ from the bottom of the jar and made several marks with the dry erase marker. 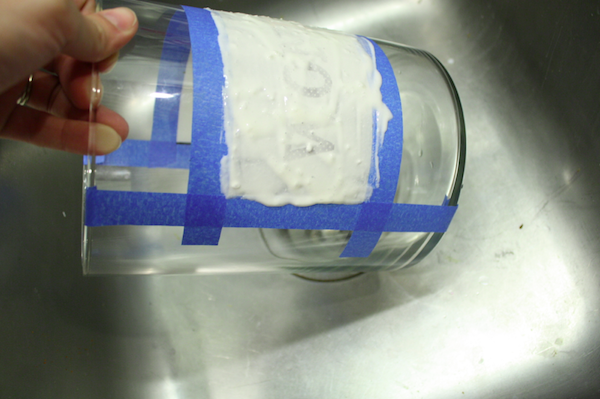 It comes off with the tape, actually, but also rubs off with your finger, so it’s perfect for marking on glass surfaces. I placed a piece of tape along my marks. 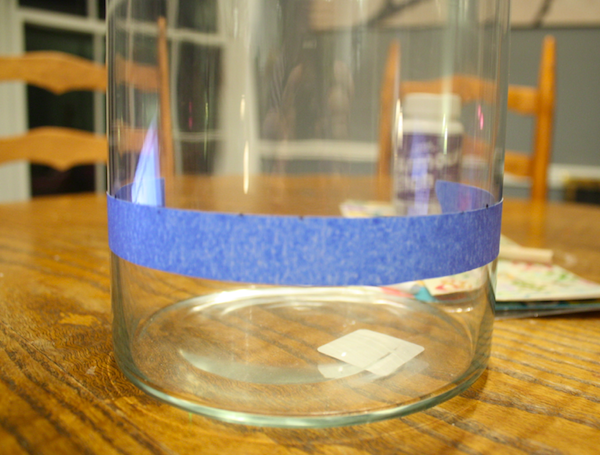 Then I repeated from the top, marking off the middle section of my jar. 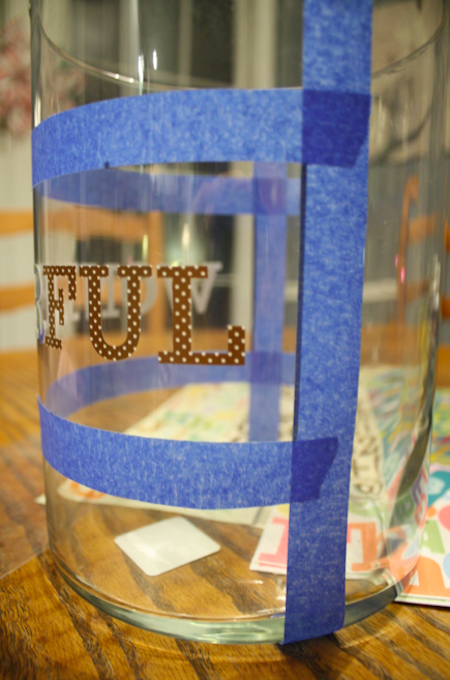 Taking pictures of a clear jar is pretty darn difficult, so please excuse my blurry pictures for this part! You get the idea! 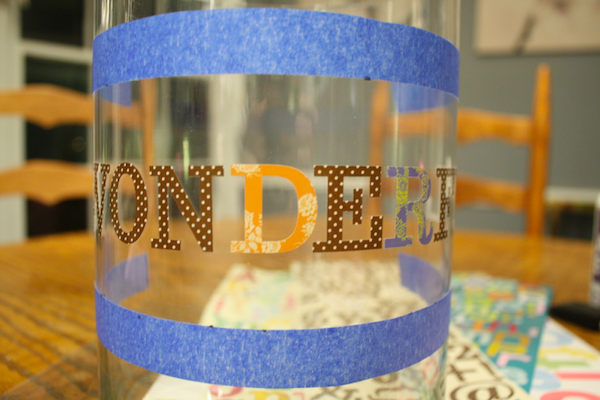 Using the stickers, I spelled out WONDERFUL across the middle of the empty section. I didn’t measure, I just eyeballed it on there. I have a ton of letter stickers and I usually pick them up when I see them on clearance at craft stores so I have them on hand for times like these. Make sure you press your stickers on firmly and entirely. 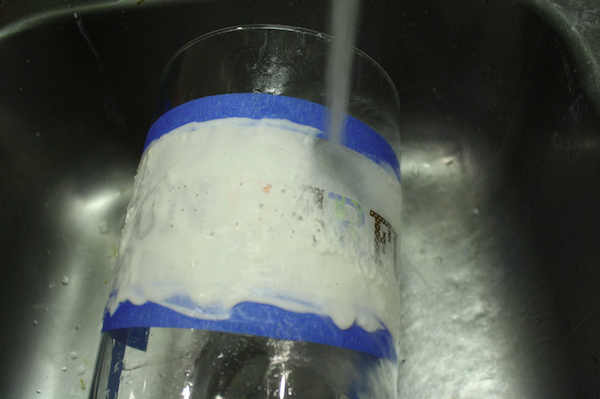 Anywhere they’re not securely stuck to the jar will allow etching cream to seem under them and leave less-that-stellar lines. Once all my letters were on, I drew a line vertically between the pieces of tape and added a vertical line of tape to square off the area around my word. Again, press the tape on well! Now comes the fun part! The bottle of etching cream will tell you to wear gloves and I have to encourage you to follow that rule. I usually use yellow dishwashing gloves, but mine were tossed a few weeks ago so I got out my latex gloves I keep on hand for cutting up peppers. 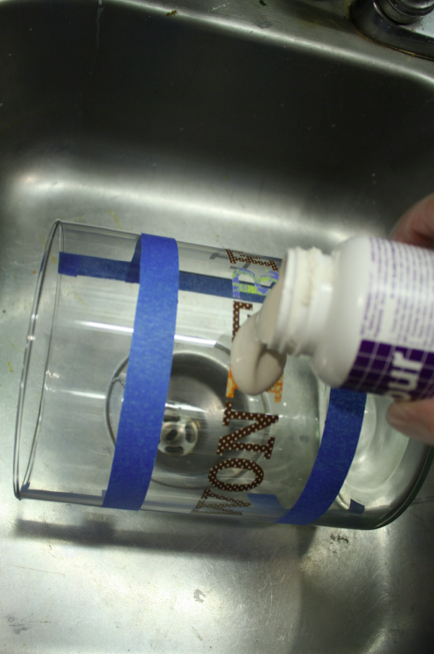 I like to put the item to be etched in the bottom of the sink and pour a little etching cream on it. Then I take my brush and smooth it out. 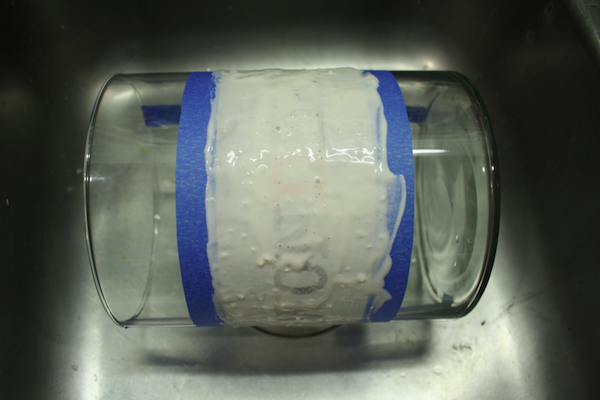 You want a thick layer, not too thick, though, because that can cause it to run outside your taped area. Make sure you get it all the way to the edges of the tape and that your layers is a consistent thickness. The instructions say to let it sit for 5 minutes. I usually wait about 6 just to make sure it gets good and etched. 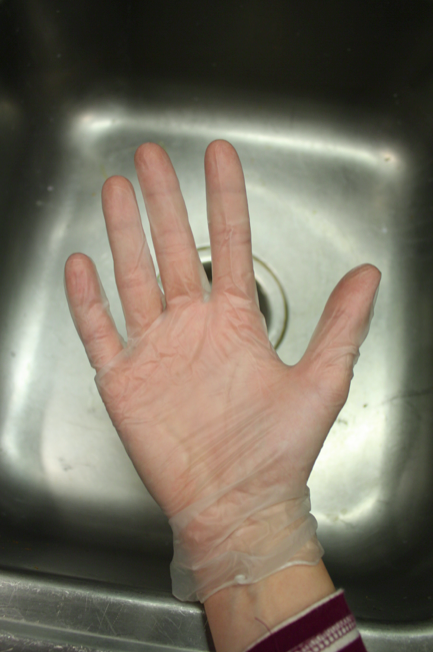 Then hit it with water and with your gloved hand, rinse the etching cream off. I like to give it a once over to make sure the full area was etched before I wipe off the stickers and tape. 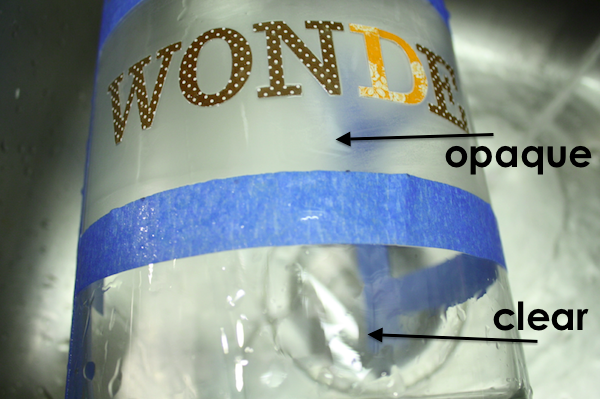 You can tell it etched because the area will be opaque and there will be a noticeable difference between it and the rest of the jar. Then simply wipe away the letters and tape and throw them away and you’re done! This little project took me 30 minutes start to finish. While the jar etched I roughly cut up some pretty scrapbook paper I had on hand to put in the jar, but any paper will work. **Etching cream is pretty expensive so I buy it at Michael’s with a coupon to cut down on the cost. 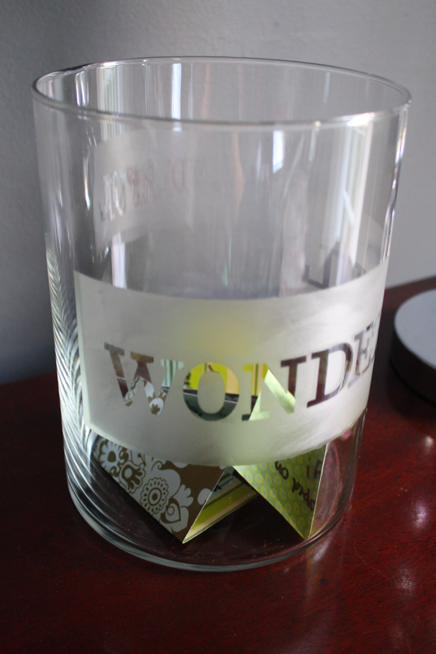 But a little goes a very long way and with some inexpensive jars (thrift stores are excellent places to source these, also Walmart has very cheap ones as well as dollar stores) and with just a few minutes you can create some amazing personalized gifts that are truly one of a kind. I like to etch vases with initials or words like “love” and “bloom” then fill the vase with a pretty bouquet and give it as a gift. You can also etch the bottom of casserole dishes with a family’s last name, personalize craft jars, etch glass in pictures frames, the ideas just go on and on. I’m guessing this is where you saw this idea. No, actually I’ve never seen that. Thank you for sharing, it’s a wonderful idea, too!! I just saw a friend say something in text about it on Facebook and ran with the idea from there. But I really like the Thanksgiving spin on that one, especially if you don’t want to commit to the whole year. This is such a precious idea. Thank you. This is a wonderful idea, thank you so much. I really really love everything about this project, thinking I might use it this Christmas for family handmade sister gifts. But I’m dying to know. Is the jar still on your table?? Yes! 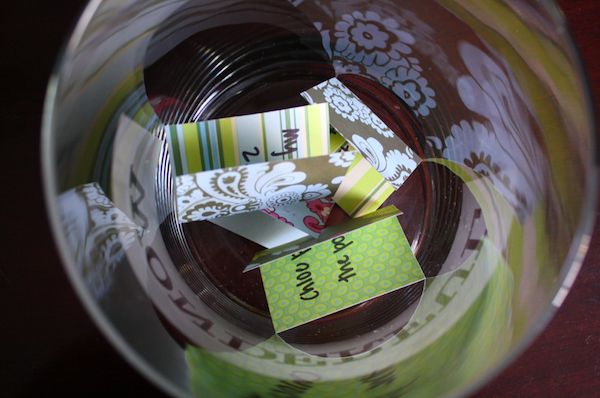 About once a week I write something down and toss it in the jar. Sofia is in Kindergarten and is learning to write and has been adding her own wonderful things, too. The matchy, pretty paper is long gone, but the sentiments are still there.